This is not “small girl with big God” data plan but ‘small money big data’ for those who knows. 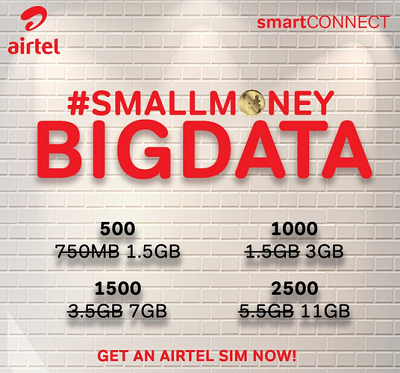 Airtel has once again introduced a new data plan available on SmartConnect for prepaid customers. Airtel SmartConnect has always been known as a plan that gives its prepaid users bonus upon recharging their lines. The new plan gives you the opportunity of getting double data and eight times your recharge value with Airtel smartconnect. 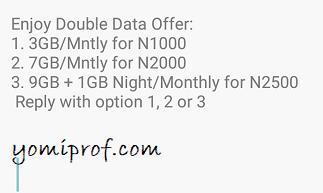 This offer is exclusive to new subscribers on Airtel network but if you are an old subscribers just like me, dial *144# to see if you are eligible for Airtel double data offer. If you are eligible, reply with 1,2 or 3 depending on the package you wish to subscribe for.